WHEN DENSMORE WAS STUDYING the Sun Dance on the Lakota Standing Rock Reservation, an elder named Red Fox announced to an assembly of leaders that he would adopt her as his daughter. According to Densmore, this "very prominent chief" had a daughter of the same name who had died years before. The person whose name appears in the songs is Two White Buffalo, whom Red Fox adopted in place of his deceased daughter and to whom he gave his daughter's name. Red Fox stated that he had a right to give this name as he had killed two white buffalo. Whenever these songs are sung it is expected that Red Fox will make, in behalf of Two White Buffalo, a gift to the singers or to any project for which donations are being solicited. Red Fox is a man who is highly respected in the tribe, and these songs have been widely sung. This is the honor song composed to honor Densmore on her adoption by Red Fox. It is sung by Shoots First and recorded by Densmore. Several Lakota were present at this recording session. The song starts with a spoken introduction and ends with spirited whoops. Densmore stayed in touch with Red Fox after she left the Dakotas. In 1917 he implored his daughter to visit, saying he was ill from not seeing her. I wish to see my daughter again some time, this all at our Fair if possible. I've not seen her and I'm sad. It seems I'm sick by not seeing her. In all this District the people are anxious to see her too; and her mother has some collection of beadwork and a tipi ornamented with painting; when she comes she shall have them. I received a cross and a rosary from her which were consecrated by the priest; we are still keeping them, they are the best we have. It has been our custom in the past to honor our beloved ones, so that we usually give away feather hats to the poor. I also gave her 2 horses; and I drove them up to sell them; they are at my camp for her. I won't send her the money; she (my wife) wants me to sell them, but I want to keep them for her till she comes. I want to give her this pipe and tobacco pouch; I am keeping them for her, which she can give to the President. If she is coming she can notify Crow Ghost, who is my nephew; and he is her cousin; so he can take her down to my place. In explanation of the foregoing it may be said that an Indian does not distinguish between the words "given" and dedicated. Thus a horse or other object is considered the property of a person to fathom it has been "given" though it remains in the possession of the donor. The recipient has a right to claim it at any time. 1. "Memorandum to Charles Hofmann 1943..." in Frances Densmore and American Indian Music, Charles Hofmann ed. (New York: Museum of the American Indian, 1968) 33. 2. 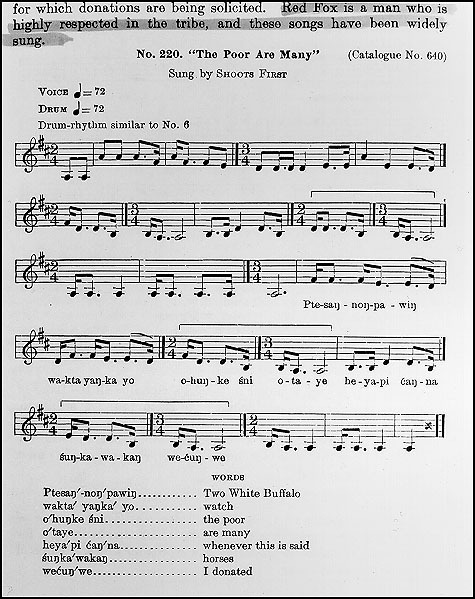 Shoots First, The Poor are Many, Densmore Cylinder Collection, Library of Congress Archive of Folk Music, 10,577:B2. 4. Bulletin 61 is available as Teton Sioux Music and Culture, Lincoln, NE, University of Nebraska Press, 1992.